Portions of the following article originally appeared in The Groove, a Seoul-based expat magazine, on August 7, 2007. Update: Geumgangsan, the tourist village covered in the post below, was closed in 2008 after a 53-year-old South Korean woman was shot and killed by North Korean soldiers when she mistakenly wandered into a military zone. As of September, 2011, cruise ships mostly catering to Chinese now stop here. The air smells of mold under the off-white plastic tent covering the North Korean immigration office across the far eastern stretch of the DMZ, also known as the 48th parallel. It is a pale and poor comparison to the three-story steel office of their southern counterparts; surrounded by military personnel on all sides, it feels like a forward base on a frontier that was built overnight. That’s how I would like to say I entered North Korea. But in truth, the story starts a few hours before, on a tour bus in Seoul packed with foreigners, mostly from Europe and North America, all at seat’s edge awaiting the unknown. Continuing towards immigration, every 500 meters along the road stands a stationed North Korean soldier with a red flag ready to radio in help if any suspicious activity is noticed amongst the passing travelers. The rules are strict and serious. Stay on the tour, always wear your issued ID pin and hang your passport around your neck, and don’t take pictures of any North Koreans, military vehicles or personnel, villages — or even anything while the bus is moving. If you are caught breaking this last rule, we are told, a red flag will be raised and the whole bus must return to South Korea. In front of the immigration tent, soldiers glare at passerby exiting the bus with permeating eyes while a song hums a set of repetitive lyrics over a make-shift loudspeaker. Pangapsumnida – nice to meet you, greets the northern song. Welcome to North Korea, now stand in line by number and don’t talk. A man in a big, brown bear costume, the mascot of Geumgangsan, a mountain town just a 20-minutre north of the border, waves us in through immigration and out of the plastic tent. The light filtering through the tarpaulin material gives the otherwise out-of-place bear an appropriately eerie yellow hue. There is no visa required for entry to North Korea per se; travelers book a fully planned tour and get a slip of cardboard stamped on the way in, returning it on the way back out. Outside and to the left of the tent is a train track on a hill with soldiers spaced out intermittently in front of mist and mountains, painting an ominous backdrop for the statuesque sentries. 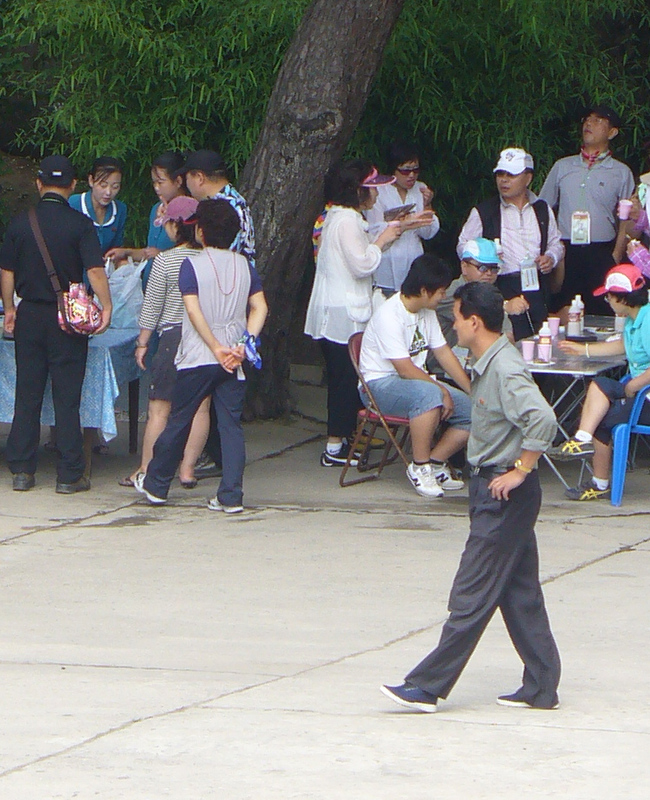 The only picture I was able to steal of North Koreans on the hiking trail. Can you spot the three in this photo? North Korean soldiers are suited in dark greenish, almost brown, uniforms. They all have a red lapel pin over their left pocket with the picture of Kim Il Sung, The Great Leader. The pins come in different shapes, giving the soldiers a rare opportunity to accessorize. Their uniforms all look uniquely Soviet, especially their large, furry hats that lift five inches over their forehead, prominently displaying a red communist star. 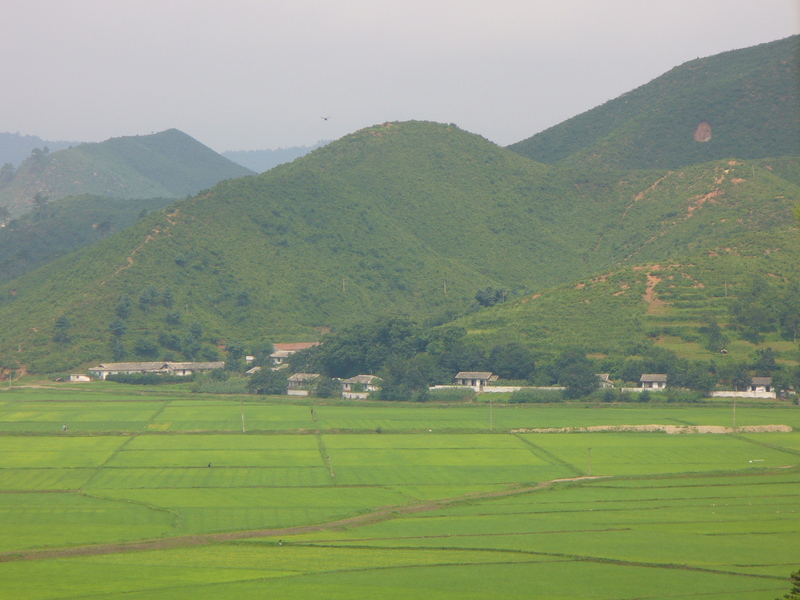 While most landscapes in South Korea seem to roll – in North Korea they tend to zig-zag. Spiky spires of these peaks shadow the tiny gray and black communes situated at the base surrounded by unbroken acres of farmland. There are tank shelters built into the sides of the mountains facing the road and ready to go, assuming that the North Koreans have regularly fueled them since the armistice some 50 years ago. The gray homes are cracked and crippled by years of neglect. Outside the bus window, farmers toil in the field, ever so often glancing up at a particular piece of motivating propaganda that centers their commune. Two girls look up at the bus and wave happily at tourists. Their clothing is colorful and doesn’t seem to be too controlled. Geumgangsan itself is a place of myth and mystery. The two-day hiking tour that is regularly offered will take you to the two best mountain sites with the option of seeing a manicured beach surrounded by the picturesque Geumgang mountains, as well as a show by a group of Pyongyang acrobats. The mountain range opened to tourists in 1998 and has since been attracting a wealth of travelers – the majority being South Koreans, who own the hotels — including foreigners, who are segregated from the rest. As majestic and awe-inspiring as the mountains are, their daunting cliffs and jagged peaks just barely manage to distract you from the grim realities that encompass the crippled communist nation, ubiquitous monuments built for the Great Leader further constantly reminding of where you have come. Traveling to North Korea is anything but lonely since travelers can only enter the country on prepaid tour groups. Hotels reservations, hiking paths, and itineraries have been laid out far in advance to ensure as little contact is made possible with arguably the most secretive country in the world. The main road is even called “Tourist Road.” When entering North Korea, it is safe to assume that you are seeing a sideshow of sorts, a kind of zoo where you are not sure which side of the cage you are on. 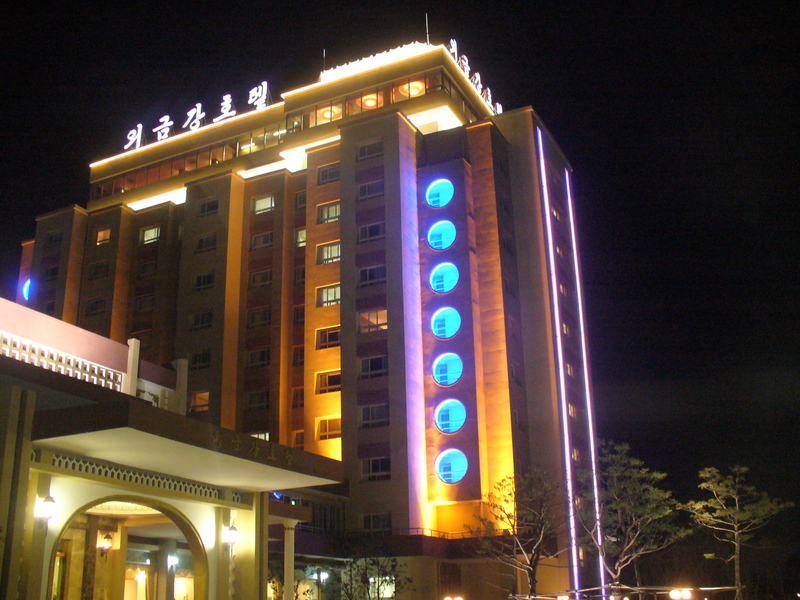 The hotel in Guemgang is classy under the circumstances, and the tourist village is full of all the amenities you might expect, ranging from fine North Korean dining, soju and spas, to the new noraebang (singing room) and Family Mart convenient store. 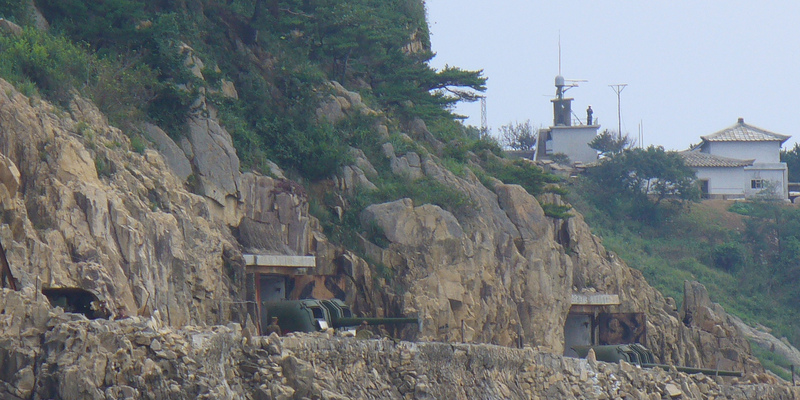 Turrets positioned on a cliff face the Yellow Sea, also known as the Sea of Japan, that I originally thought was just a mountain. To the bottom left, there is a man with binoculars watching me. The tour complies with a strict itinerary. Any time you exit your hotel, it is mandatory that you wear your passport on a lanyard around your neck. To ensure the “privacy” of the North Korean citizens, small squads of soldiers constantly circle the premise in synchronized goosesteps. From the rooftop restaurant of the hotel, a group of five soldiers marching single file in the fields directly below pass about every five minutes. However, despite the length to which security is maintained and “face” attempted to be preserved, the entire complex is built in the backyard of a drafty, dilapidated farming village alongside a nearly drained creek. 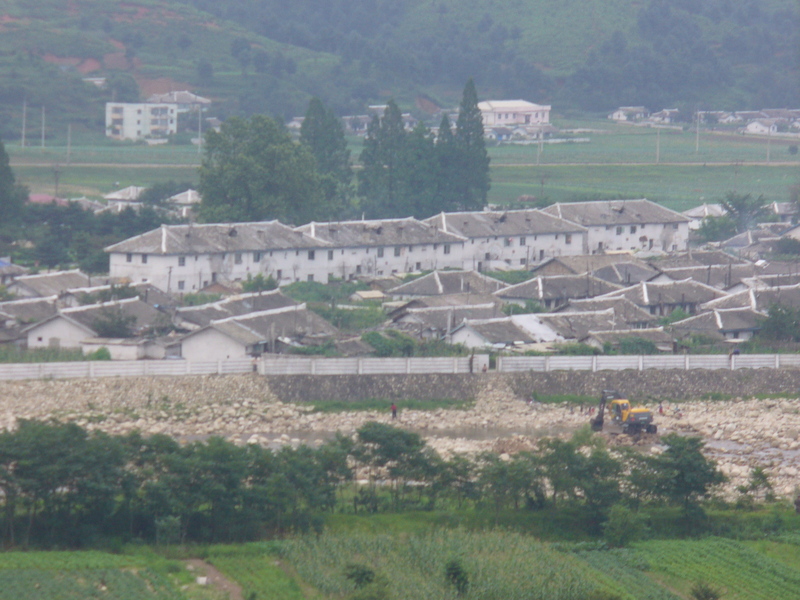 If the North Korean government were at all trying to prevent outsider knowledge of the utmost poverty that exits in their country, it would seem a logical idea to keep tourists out of the direct line of site of villages that look like this. This means it was understood that, in a country that strips citizens of electricity, when the village goes completely dark at dusk, foreign tourists staying at a gaudily lit hotel are able to witness it – pondering how its residents will cope without heat or light throughout this chilly, early autumn night. The North Korean people are as out of touch as the country itself. Guides on the trails can be spotted by locating their red Great Leader lapel pins. To me, it feels sort of like a demented Where’s Waldo puzzle; in this case, trying to locate the lapel pin to differentiate tourists from the locals. It is important to remember not to stare and to never say the name of the Great Leader, Kim Il Sung, in the presence of a North Korean. 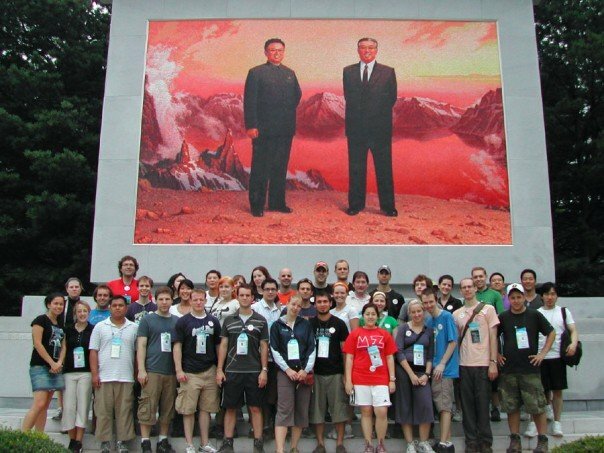 The only religion allowed in North Korea is worshiping the Great Leader, so the temples along the tour are purely for show or used to pay homage to him during spontaneous shows of public paeans. 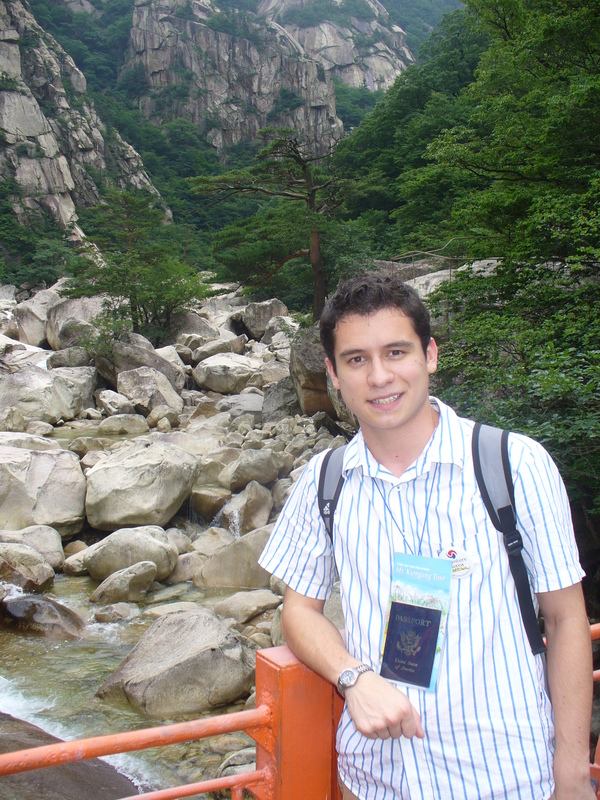 Hiking the trails offer the only opportunity where you can talk with North Koreans that speak a bit of English. Although they will communicate with you, it can be a bit odd and awkward at times. “I hate speaking English,” proclaims one of my guides. She is very fair skinned and cutely giggles when her broken English fails her. During our conversation she mentions that she “hates Americans,” but considers their presence in North Korea “OK.” She mentions that she likes to travel, and I inquire where she has been. “Many places in North Korea,” she exclaims with a smile. She has never left North Korea, but insists that she “can leave if she wants to.” Her answer suddenly sets me back a little bit. Even if North Koreans wanted to leave the land of the Great Leader, it has been reported that the families of defectors suffer the wrath of state-sanctioned reeducation in the uncharted labor camps of the far north. Back in the small auditorium of our enclosed compound, in the safety of our fabricated tourist enclave, the show is about to begin: The Pyongyang acrobats of the Maraebang circus. The curtain rises to a hushed crowd. A lone actress emerges towards center stage wearing a pink hanbok that is so big it makes her look like she is floating across the stage. Her voice twills in a manner that is both singing and speaking at the same time. 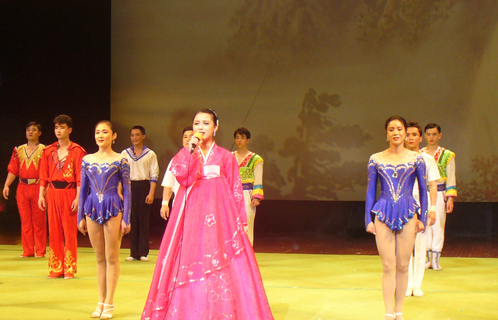 No photographs are allowed until the end of the performance, but most audience members would be too stunned to bother grabbing their cameras anyways. There is a flying trapeze act, jolly North Korean clowns that look like Mario and Luigi, swift jugglers, and minutely choreographed mid-air ballets. It is truly a circus that is out of this world – or at least the world outside of North Korea. Six boys in blue and white Donald Duck-esque sailor outfits perform several stunts, accentuating their massive upper body strength. They climb up two poles using only their arms and point their legs up and down motioning perfectly in sync with each other. They lock arms and legs together making a giant V, while the youngest looking boy grabs two sheets and proceeds to wrap himself upwards to the top of the apparatus. Once in place, he releases the rope and flips back down to the ground unraveling a large red banner displaying a picture of North Korea and the word hana, or number one. Their political stance in the world might not be number one, but, like me, if you’re looking for one of the most mesmerizing experiences in the world – you need not look any further than into the country directly beyond the border.